Supertech Pistons are manufactured from extruded high silicone, enhanced 4032 alloy (with additional Cu, Ni & Mg) that had low thermal expansion, excellent wear resistance and higher thermal conductivity. 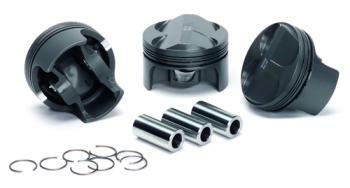 Supertech Pistons, with this alloy, have withstood up to 42psi of boost, with alcohol, without any problems. A two or three step forging process yields a fine structural grain which are then submitted to several machining steps in state of the art CNC machines. Several heat treatments provide the piston with high tensile strength and evenly distributed hardness. Contact reduction grooves are standard, and pin bores are honed and reamed for precise fit. Wrist pins are constructed of cold extruded chrome moly steel for high strength and used with wire clip locks. Finally, the pistons receive a ‘phosphate dry lubricant’ coating to protect the rings against ‘micro-welding’ and enhance lubrication on the skirt/cylinder area. Compression ratios are computed with .030” head gasket and .010” deck unless indicated in each case.